Published: Oct. 21, 2016 at 11:59 a.m. Updated: Oct. 21, 2016 at 06:19 p.m. When trying to understand the New York Jets and the quarterback position, think about "Wheel of Fortune." You know the show, right? If not, you need to start spending more time with your aunt. She loves you, you know. Anyway, think about that wheel. The contestants spin it with the dreams of acquiring prizes and riches. The worst thing that can happen is that the ticker stops on one of those infernal "Bankrupt" wedges. This represents the elite FML moment of prime time television. The Jets are the contestant who can't stop hitting "Bankrupt." They'll survive a few spins, maybe win a trip to Peru or a Jet Ski they'll never use, but in the end, the wheel always turns against them. It becomes the Wheel of Misfortune. Ryan Fitzpatrick went belly-up on Wednesday. After an eyebrow-raising flip-flop from Todd Bowles, the Jets decided to bench The Artist Formerly Known As Fitzmagic in favor of Geno Smith. This was something of a cosmic joke for Jets fans certain they'd already boarded the GenoCoaster for the final time. The seeds for Fitzpatrick's demise were planted back in Week 3. The Jets flew to Kansas City on a high, coming off a Thursday night win over the Bills in which their quarterback played like a better-educated Joe Namath. Seriously, I invite you to watch the Game Pass footage. Fitzpatrick was an outrageous mad bomber. Unfortunately for the Jets, it turned out to be a mirage. Against the Chiefs, Fitzpatrick suffered a six-interception meltdown and never recovered. Four weeks and four losses later and the Fitzmagic was gone. You need to appreciate the timing here to really put things in perspective. Fitzpatrick was benched on Oct. 17. He signed his new contract -- a one-year, $12 million deal -- on July 27. The man got a 300 percent raise at the end of July and didn't make it to Halloween! This was a stunning fall from grace. These are the times where you have to give the Jets credit. Basic quarterback ineptitude isn't that hard, really. The current iteration of the Cleveland Browns have been blowing first-round picks with vigor since Jar Jar Binks was a pop culture touchstone. But the Jets' self-sabotage at the position shows a level of ingenuity other teams lack. They're like The Beatles recording "Sgt. Pepper's Lonely Hearts Club Band" in this respect. They're just on a different level than their peers. The Geno-to-Fitz-to-Geno saga continues in this proud tradition. Somewhere, a smiling Tim Tebow daydreams in the outfield. For many Jets fans, Fitzpatrick's demotion couldn't come soon enough. When I suggested this week that Geno Smith's behavior leading into and during Monday's night loss to the Cardinals shouldn't have been rewarded with promotion, Jets Twitter came after me with a barrage of insults typically reserved for an ISIS commander captured on U.S. soil. That's something you need to understand about Jets fans: We eat our own. We're like the common hamster of NFL fanbases. And while many supported the Fitzpatrick demotion, others -- like me -- struggled to let go. 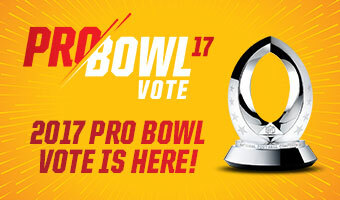 After all, Fitzpatrick went through a similar (though not as calamitous) funk in the middle of last season before trimming his beard and playing the best football of his life during a five-game Jets winning streak. Part of me thinks Mangold should just bust out the razor and shave Fitz down to a human seal and see if it takes. Nobody consults me on this stuff, unfortunately. 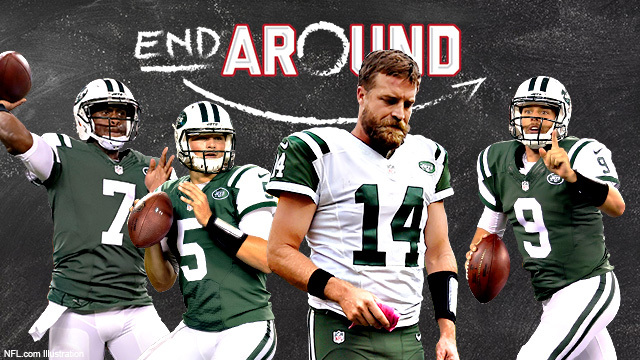 Fitzpatrick's unlikely Cinderella run was special to a lot of Jets fans, folks who've come to view a special Jets quarterback season in the same way a "Planet Earth" producer views a spotted snow leopard sighting. I started following the Jets in 1988. Here's the complete list of what I'd consider standout seasons at the position in those 28 years. Testaverde replaced an ineffective Glenn Foley three weeks into the '98 season and led the Jets to a 12-1 record the rest of the way. The offense was paced by Keyshawn Johnson, Wayne Chrebet and Curtis Martin, and Testaverde set a Jets franchise record with 29 touchdown passes. The Jets went 12-4, won their first ever AFC East title (seriously) and won a playoff game before an AFC Championship Game loss to the Broncos. Pennington replaced an ineffective Vinny Testaverde (the world is, like, cyclical, mannnnn), paced the league in completion percentage and passer rating and led the Jets to an 8-4 finish and their second (and still most recent) AFC East title. Seriously. Pennington's Jets won a playoff game, too, embarrassing Peyton Manning and the Colts in a 41-0 conquest before falling to the Raiders in the divisional round. Fitzpatrick replaced starter Geno Smith after Smith got knocked out by a teammate over a $600 plane-ticket debt. Seriously. Fitzpatrick instantly took to Chan Gailey's offense, led the Jets to their first 10-win season in four years and threw 31 touchdown passes, breaking Testaverde's franchise record. That's it. That's the entire list. And I'm kind of cheating even including Fitzpatrick! The Jets missed the playoffs last year, mostly because Fitzpatrick threw three interceptions in a noxious Week 17 loss to Rex Ryan's Bills. Beyond that, many people whose football opinions I respect point to the dynamic wide receiver tandem of Brandon Marshall and Eric Decker as the main driver of the Jets' offensive success in 2015. I tend to view that as one of those "chicken or egg" conundrums, but whatever. One more note about those three quarterbacks: None of them ever came close to repeating their success beyond a solitary season. Testaverde popped his Achilles in Week 1 of the '99 season and was never the same. Pennington's '03 campaign was ruined by a preseason wrist injury, and shoulder problems kept him from reaching his potential. Now Fitz. From unlikely franchise star on Sept. 11 to benched and soon forgotten on Oct. 18. Spinning forward, there are several directions Bowles and general manager Mike Maccagnan can go. After all, the Jets have four quarterbacks on their roster. Fitzpatrick and Smith will be free agents after the season and won't be back. So turn it over to the kids, right? Well, 2015 fourth-rounder Bryce Petty injured his shoulder on his final pass of the preseason and just got back to practice. He's not ready. How about you give your second-round pick a shot? Well ... based on initial reports, we can expect Christian Hackenberg to be ready for the job sometime around the end of Mark Cuban's second term in office. A few weeks back, Marshall was emphatic that he wouldn't lose faith in his starter. "I am. Going down. In the boat. With Ryan Fitzpatrick," he said. On Wednesday, Marshall accepted reality. The Jets landed on "Bankrupt" again. Can Pat Sajak throw a spiral?